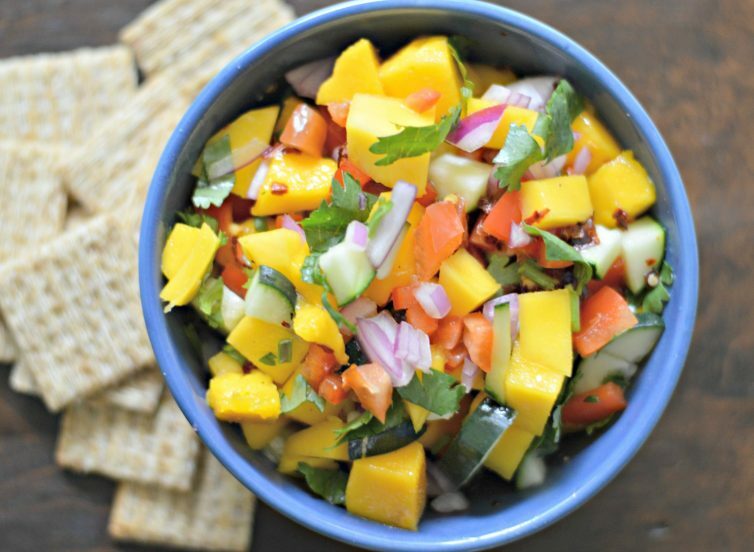 Inside: This fresh and easy mango salsa, with fresh mango, cucumber, and more, will hit all the spots this summer. I am from Mexico, so that means that I love eating salsa! There are so many different types of salsas to try, but one that I love is this fresh and easy mango salsa. It is loaded with fresh and delicious ingredients, and is sure to please any crowd. I’ve mentioned in previous posts that my grandparents had tons of mango trees on their ranch in Mexico. My siblings and I always used to gather them and bring them to my grandma (at least the ones that we didn’t eat first). As a result of that experience, I still love eating mangoes whenever I can. I also like to include them in many different recipes. 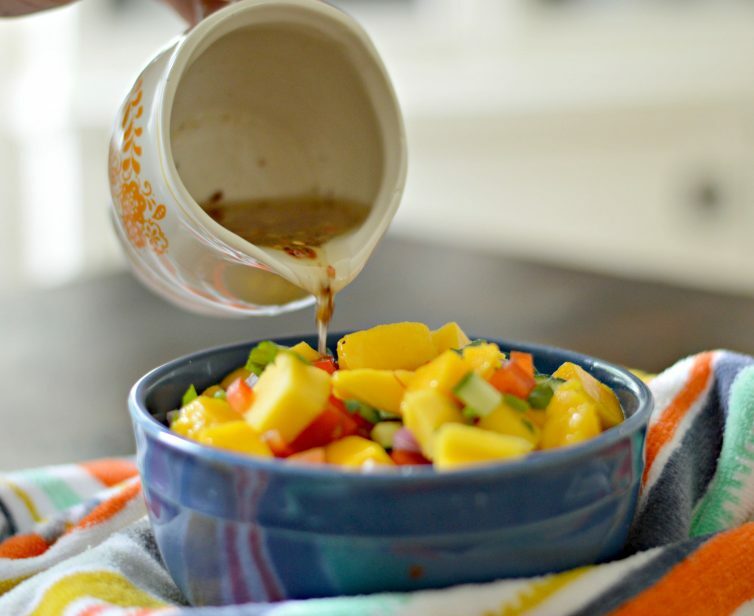 What Ingredients do you need to make Mango Salsa? 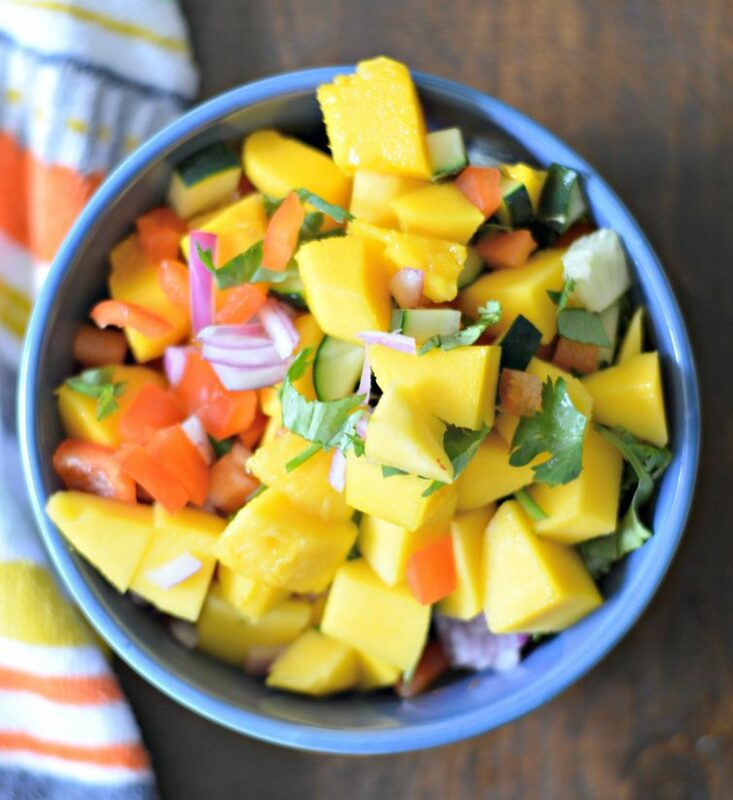 Aside from mangoes, this mango salsa includes many other fresh ingredients as well, like red peppers, cucumbers, cilantro, and lemon juice. You can enjoy it with fish tacos, freshly cooked tortilla chips, these jerk chicken tacos, whole grain crackers, and more! I love to enjoy this salsa on hot summer days along with a nice refreshing drink. For example, you can make this delicious fresh strawberry lemonade, hibiscus tea (agua de jamaica), or even horchata. 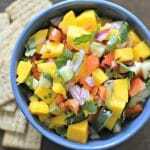 This mango salsa also has a delicious dressing that I add to it to add a little bit of spice and a little bit of sweet. Once we started eating it, we had a hard time stopping! I hope you enjoy it as well. This fresh and easy mango and cucumber salsa goes well with so many meals or just with homemade tortilla chips. Combined all of the fruit and vegetables in a large bowl and mix well. Pour the dressing over the fruit and vegetables and mix well.